After some great opening lessons at the start of the semester, I was trying to figure out what lesson I should do with my high school youth group on Sunday morning. I was going to teach them about an experiment that has taught me a great deal about how to best live out my faith, but then I realized: they’d learn the lesson better if they did it themselves. So today, I ran the experiment on them. Back in 1973, Darley and Batson performed a psychology experiment at Princeton Theological Seminary, in which they asked a group of students to prepare a sermon on either the Parable of the Good Samaritan or on Christian vocation. These students were then instructed to deliver the sermon in another building across campus. They were put into three conditions: high hurry (in which they were told they were running late), medium hurry (in which they were told to get there quickly), and low hurry (in which they had plenty of time). Along the path to the other building, there was a “victim” lying in an alleyway. The real experiment was designed to see how many people would, like the Good Samaritan, stop to help the victim. 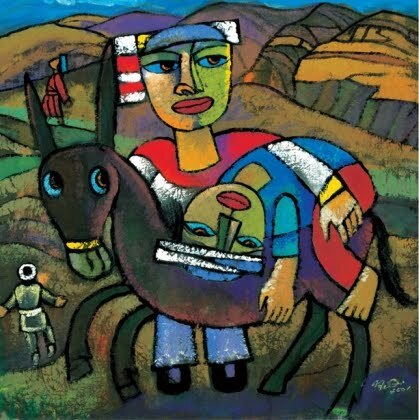 An illustration of the parable from the Chinese artist He Qi. Interestingly, being primed by reading the Good Samaritan didn’t improve your odds. Nor did your level of religiosity. The most important factor was simply: were you in a rush? In low hurry situations, 63% helped, in medium hurry situations 45% helped, and in the high hurry situation only 10% helped. To me, it’s a lesson that no matter how much scripture we read (or ethical philosophy for that matter! ), if we are always in a rush and consumed with our own tasks, we will fail to implement it. Since Irvine kids tend to be pretty consumed with their homework, extracurriculars, and test prep, I thought it would be an important lesson for them to grow as disciples of Jesus. I gathered them all into the room, and told them we’d be doing a special activity today. Our church has a large Chinese ministry high school group, but I work with the English students. So I told them we were going to start a “penpal” group with the other ministry, in order to help teach them English. They were to write a letter on the parable of the Good Samaritan, and then they would go one by one over to another room to deliver it to a student there, with whom they would chat. Interestingly, many of them were instantly reticent – what if my English isn’t good enough? What if I make a mistake? What if I make them worse. (This may suggest a whole different lesson on self-confidence, considering how genuinely talented and brilliant most of them are.) But I cajoled them into it, and left the room to place my “plants.” I borrowed a 2nd grader from the children’s ministry and put her along the path. She leaned against a wall, grabbed her stomach, coughed loudly, and generally looked sickly and in need of help. The three students who didn’t stop all gave their reasons, which I think are actually illustrative of the reasons why we miss the needs of others when we’re always in a rush. One said that he didn’t even notice her as he passed by (let those who have eyes to see see!). Another said that he saw her, but that there was another woman in a wheel chair passing by, so he just didn’t pay much attention. The last one – the actual sister of the fake victim! – said that she saw her, but was distracted when our pastor walked by at the same time. (Whether it was pure distraction or that she thought he would help because he’s an authority figure who would help was unclear.) In all three cases, I emphasized that the lesson to take away is not that these three students are bad people, but rather that any of us can miss out on the needs of others when we’re too consumed by our own perceived needs. Sometimes what we need is not simply to learn the scriptures better, but rather to not let our anxiety distract us from the world around us. Only then can we follow the model of the Samaritan and truly love our neighbor as ourselves. 1. Not dumbing down anything. 2. Actually asking them to analyze scripture thoroughly by themselves. I’m not sure how they feel about the third one. Obviously it’s still much easier than a class in school, since much of it is fill-in-the-blank. But it’s more “work” than the standard listen-to-a-feel-good sermon. I’m making them actually write stuff down for two reasons (a) I’m trying to eliminate the fluff, so actually all of the ideas I want them to record are theologically significant / powerful and (b) they’ll remember better if they actually take notes and have to find the ideas in the text for themselves. I’m including my two worksheets for anyone else seeking decent resources. (They aren’t perfect, but I found them personally more helpful than anything else I found. If you want to rework it for your own, I’m happy to send you the google doc directly if you email me or send me a message through this site.) There are answers in red included on the second set. One of my students declared, during our sharing of how God has worked in our lives, that nothing had happened and God hadn’t worked at all. I gave him “a homework assignment” to try during the next week to live out his faith and to be more diligent in trying to see God at work. He reported back the following week that he decided to stand up when another kid was being picked on. To his frustration, this caused him to be punched. But – he didn’t fight back! He turned the other cheek! I prayed as we closed that we might all follow this student’s example of non-violence to become more like Christ. I said how proud I was of him, and I hope that more good stories like this will soon follow.